Beautifully designed three bedroom Mediterranean style Villa located in the heart of Lakeside Villas gated community near Dorado right on a secluded beach. Master balcony overlooks the lake and gardens with an ocean view! Patio overlooks pools and beautifully manicured landscaped gardens with lake and water fountain. Fully air conditioned with many amenities. Championship courses 5 minutes away. Tennis courts on the property, with playground and ping pong table. Wonderful setting for multiple families or friends to get together. Villa includes free internet, cable TV, DVD and kids games. Maid service and Personal Chef available. Tours and car rental delivered to the villa upon request. With this rental we offer 24/7 access to local Guest Services Manager that can assist you with information about access to the Ritz Reserve and Embassy Suites Resort amenities- including Spa- Watersports- Dining - Golf and more. Master Bedroom en-suite: King bed, Cable TV, large balcony overlooks lake; Couches; Armoire. The exclusive Paradise Villas & Vacations comprehensive “Guest Resource Guide” with details on everything from medical resources, to excursions, to dining. The spacious Villa de Palma provided us with a peaceful respite from the hustle and the bustle away from the larger metropolitan areas, yet it was close enough to shopping malls and other beach resorts in the Dorado area. The serenity of the complex was therapeutic to us. Every morning, we woke up to the chirping of song birds. We played many rounds of dominoes at the patio table, while enjoying outdoors BBQ dinners. The many rounds of Table Tennis at the Rec Center, just a few steps away, finally improved my game. Alex was awesome, just a phone call or text message away. Thank you, Lizzie for offering your concierge services, but we were familiar with the island and its entertainment. The property was exactly as described as on the website, beautiful and fit for a king. Everything you needed was there and if not all you had to do was call Alex and he would provide. The unit was spotless inside and the grounds were beautifully maintained. We planned this trip two years in advance to celebrate our 10th wedding anniversary and once the time came the three weeks flew by. All our guests were taken back by Villa and the grounds. They still can’t stop talking about the wonderful time they had here and exploring Puerto Rico. We also had a chance to meet Alma and she invited us to be her Guest at an after party at the Ritz Carlton. Another great memory! This is a place I would recommend for family and friends who want to get away from it all and explore on their own. We visited the Camuy Caves, Arecibo Telescope, Dorado Beach and Old San Juan a must. There is plenty to do and see for everyone. Oh yes! This is indeed Paradise! english, Minimal Spanish- working on it!! Our family lives in Massachusetts. We have four boys and travel to the villa occasionally when the kids are off from school. We enjoy swimming, hiking, snorkeling, golfing and experimenting with local cuisines! In addition to my villa I manage over 50 other beach villas in the area and love to host our guests. We first rented this property for a year from the original owner after we had stayed at Hyatt for a family vacation and fell in love with area. When it came on the market we did a lot of research as to other areas and properties in PR and concluded that Dorado was the best vacation spot for our family! The weather is fabulous- dryer than other parts of the Island. Our beach is a WHITE SANDY beach that feels very private. The town of Dorado is minutes away with great restaurants, nightlife, shopping, cinema and hiking trails. There are TWO resorts nearby and you can enjoy water sports, massages and other spa services, fabulous dining, kids programs, championship golf courses and more! This Villa will feel like your private home and yet it offers you access to hotel quality amenities- the best of all worlds- lots of space - privacy and attentive service! Dorado is centrally located on the Island. 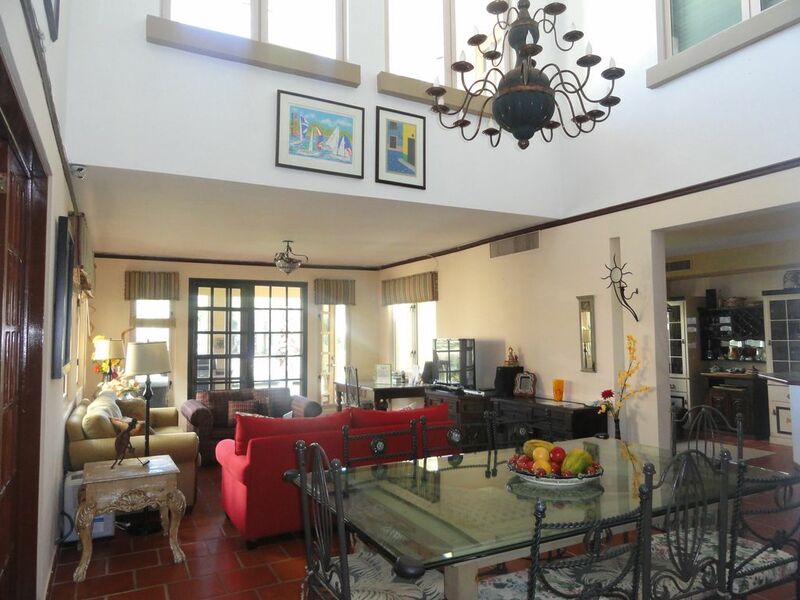 It is 18 miles from San Juan airport with easy access. Also you can take day trips to every corner of the Island in this location. The beach in front of our home is white sand and very calm- perfect for our kids. The location of Dorado is the best in terms of weather since it has the protection of the rain forest and not as rainy as some parts in the South. Recently the Ritz purchased the old Hyatt Dorado Beach Resort and upgraded it to a 5 star luxury property- this has attracted amazing restaurants and activities in the area. The Ritz has created a nature reserve on the property and developed an amazing waterpark, fitness center and upgraded the championship golf courses located minutes away from our home. Many of the resort amenities are available to our guests, including the spa, restaurants, golf, water sports and more! Near the Dorado Beach Resort- about a 5 minute drive. Master balcony has ocean views, lake views and pool views! balcony has ocean views, lake views and pool views! HIgh chair available for additional fee. * Nearby Golf Course *Putting Green *Playground *24 hour security Personal Chef and Daily maid service available upon request. We also help with transportation arrangmeents and vacation planning. We took our family Christmas vacation here and it was a perfect setting for our purposes. My wife and I have a 16 month old kiddo and we met my parents and sister for a week vacation. There are 3 bedrooms with their own bathroom so it's very comfortable. There's also a great kitchen and living room, we were able to relax and enjoy ourselves. The house is also fully furnished so you can live like you're home while you're away. Alma, Alex and Louis are also very friendly and helpful at all stages of the booking and during the stay. The real plus with this property is the location. You exit your back patio door onto a nice veranda, that has a grill if you want to use it, a table and a couch. The best pool in the community is right there, 20 steps away. Also close to the sports courts and the lounge and the beautiful, semi-private beach is an easy 5 minute walk. We felt like we woke up in paradise every morning. The only con I would mention is that if you expect a 5 star pampered experience this isn't the spot for you. No spas on-site, the accommodations are nice but they're not close to luxury. It's like you're staying at a friend or family member's house, not a hotel. There was no replacement toilet paper in the house besides the rolls that were installed when we arrived. No big deal, we bought some at a nearby grocery store, but that's kind of representative of the lacking frills. But by no means did it deter our good times. The house was perfect for our family's needs and wants. Nobody enjoyed it more than our toddler. The saddest she ever was was when we had to take her out of the ocean. She fed the ducks in the little man-made lagoon each morning. She ran around the house without making us nervous that it wasn't baby-proofed enough. We also rented a high-chair and a crib from Alma for a small additional fee. We were six adults and it was great to be able to spread out with three large bedrooms, three full bathrooms, and a beautiful large terrace with a view of the water. Alma and Alex were so responsive to us throughout our week. The villa itself was large and the beds were very comfortable but the decor was a bit dated. We had a great time visiting local attractions including the beautiful dorado beach and amenities. Alma was so helpful in advising us how to spend our time in paradise. Thank you Laura for your warm review. Your family stayed at VILLA GRAN VISTA within the same community as VILLA DE PALMA- (property # 193307)- so this review is for VILLA GRAN VISTA and I just want to make sure our upcoming guests realize this. Villa de Palma is a LARGER villa with new living room furniture and a two story living space overlooking the lake and the pool in the community. We are delighted you that you enjoyed Villa GRAN VISTA and that you gave us the opportunity to help you plan the vacation and to make the most of your time on this beautiful Island! We hope to see you back in Paradise!! Beautiful location near the ocean. Great restaurants a short drive away. Very comfortable beds. Alma and Alex could not have been more accommodating. Thank you Tom for your warm review. It was a pleasure hosting you. We are delighted you had a nice time and found Villa De Palma to be comfortable and well situated. The photos of the place and beach do not do it justice. We were delighted when we saw how spacious the villa was and how close to everything the location. Alex and Alma were awesome, from when we booked till we left they checked in with us and made sure evertything was going well. Alma really knows the area and we went on a great snorkeling trip. Alex recommended Metropol restaurant, which was great and reasonably priced (we went for lunch) My husband golfed at the Ritz Reserve course 5 minutes away and my girlfriend and I went to old san JUan on the near by ferry. Fabulous vacation, we can not wait to come back. Roomy!! Comfortable!! Fun and Beautiful. Loved the view of the lake and the pool from the back porch. Relaxed by the pool every evening!!! Great for big families!! We planned this trip two years in advance to celebrate our 10th wedding anniversary and once the time came the three weeks flew by. All our guests were taken back by Villa and the grounds. They still can't stop talking about the wonderful time they had here and exploring Puerto Rico. We also had a chance to meet Alma and she invited us to be her Guest at an after party at the Ritz Carlton. Another great memory! Dorado is one of the premier resort areas of Puerto Rico. Situated centrally with easy access to both coasts. Our villa is walking distance to the Beach and adjacent to several resorts. Championship Golf courses are minutes away as are fabulous restaurants and site seeing!